Here's your opportunity to win up to $5,000 CASH by listening to your favorite radio station. Enter the daily codes, in any order, for a chance at up to $5k three times daily (9 a.m., 2 p.m., and 5 p.m.). 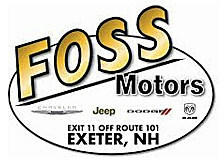 Foss Motors, has been offering you great vehicles since 1961 when Foss Motors first opened in Exeter and offered a full line-up of Chrysler and Plymouth vehicles. Over 50 years later the Foss Family has expanded to include a full lineup of new Chrysler, Dodge, Ram and Jeep vehicles in Exeter, along with used cars, trucks and SUVs by top manufacturers. You can reach Foss Motors any time by filling out our contact form, by calling (888) 295 - 2610, or simply visiting the Foss Dealership in Exeter at 133 Portsmouth Avenue, Exeter, NH.